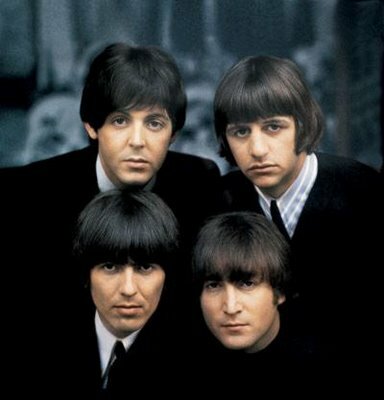 I love The Beatles (who doesn't?). I grew up listening to them; my whole family loves them. 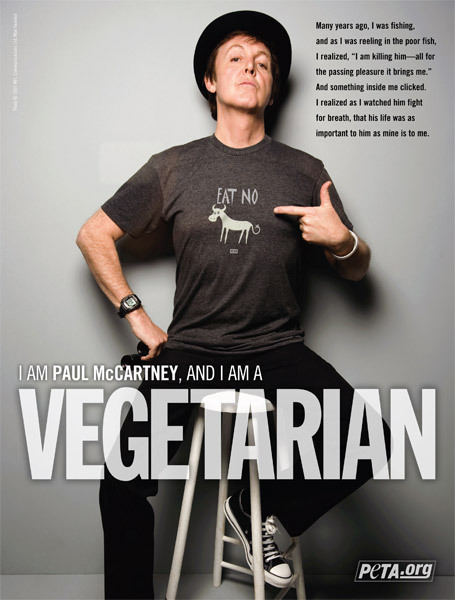 Paul is my favorite and I'm happy to have seen him in concert in the late 80's. My sisters-in-law also like them, and we used to go to Beatlefest in Los Angeles when I lived closer to that city. We even made Sgt. Pepper's costumes and dressed up like them. 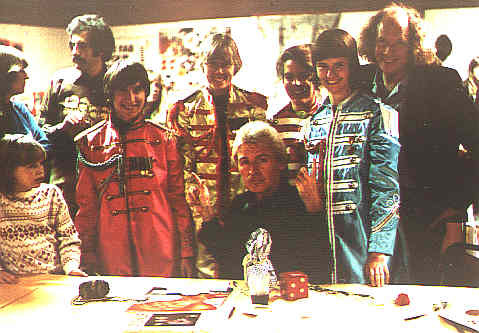 We had our picture taken with Michael McCartney (AKA Mike McGear, Paul's brother). I also collect some Beatles memorabilia. Here are pictures of my collection: #1, #2, #3, #4, #5, #6, #7. 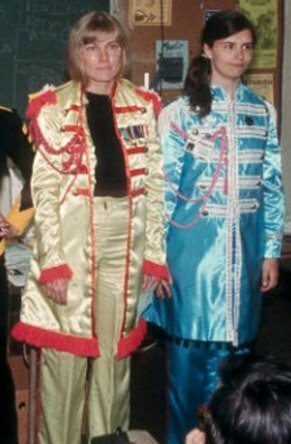 Here are Beatles pictures from my 2000 trip to London and two more photos of us dressed up in the Sgt. 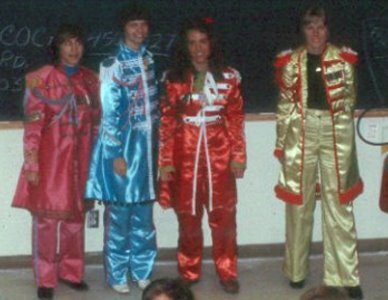 Pepper costumes. 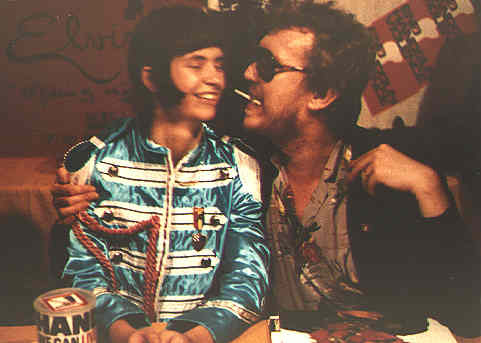 Photo #1 and photo #2 and a photo of me with Lennon's friend Harry Nilsson - he was selling kisses to raise money for handgun control. 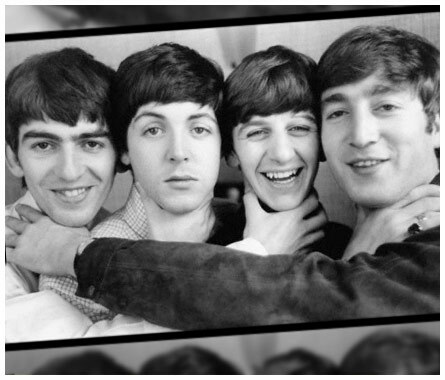 Get Beatles news from Google in your email!! Find out when Paul will be in concert near you! Find out when Ringo and his band will be in concert near you! Ringo Starr appears on "Tavis Smilye" Tuesday 1/5 and Wednesday 1/6 on PBS. Paul McCartney appears on "Late Night with Jimmy Fallon" Monday 10/7 on NBC. A LAS VEGAS CONCERT EVENT FEATURING TOP MUSICAL ACTS AND CW STARS - This concert extravaganza, filmed over two nights at the MGM Grand Hotel in Las Vegas, features performances by some of the music industry’s biggest names, including Justin Timberlake, Paul McCartney, Maroon 5, Bruno Mars, Tim McGraw, Thirty Seconds to Mars, Phoenix, Ke$ha, Drake and Miguel, among others. Cast members from The CW’s series will be on hand to help get the party started. Paul McCartney appears on "Jimmy Kimmel Live" Monday 9/23 on ABC. Paul McCartney's son, James, will appear on "Late Show with David Letterman" Monday 1/30 on CBS. Ringo Starr appears on "Late Late Show with Craig Ferguson" 1/31 on CBS and on "Conan", Wednesday 2/1 on TBS. 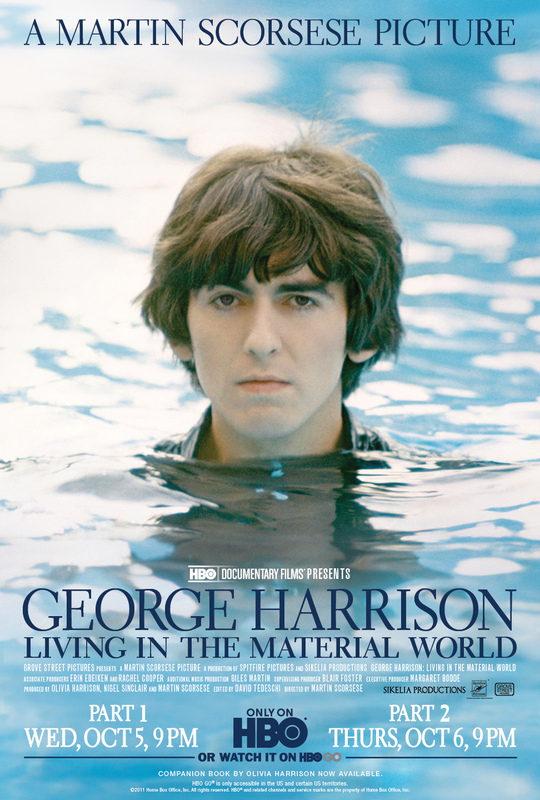 On October 5th & 6th HBO and Martin Scorsese present GEORGE HARRISON: LIVING IN THE MATERIAL WORLD. The film focuses the imaginative and inspired eye of one of cinema’s most preeminent filmmakers on one of the world’s most influential men. The film takes viewers on the musical and spiritual voyage that was George Harrison’s life, much of it told in his own words. The result is deeply moving and touches each viewer in unique and individual ways. Academy Award-winning director Martin Scorsese traces Harrison’s life from his musical beginnings in Liverpool through his life as a musician, a seeker, a philanthropist and a filmmaker, weaving together interviews with Harrison and his closest friends, performances, home movies and photographs. Much of the material in the film has never been seen or heard before. The result is a rare glimpse into the mind and soul of one of the most talented artists of his generation and a profoundly intimate and affecting work of cinema. Paul McCartney, Yoko Ono, Olivia Harrison, George & Giles Martin, Dominic Champagne appear on "The Gayle King Show" Thursday, 6/16/11 on OWN. My Review of the movie "Lennon Naked"
Paul McCartney appears on "Late Night with Jimmy Fallon" wednesday 12/29 in a rerun from 12/9, on NBC. Upon being convinced that he had not robbed anyone of his melody, McCartney began writing lyrics to suit it. 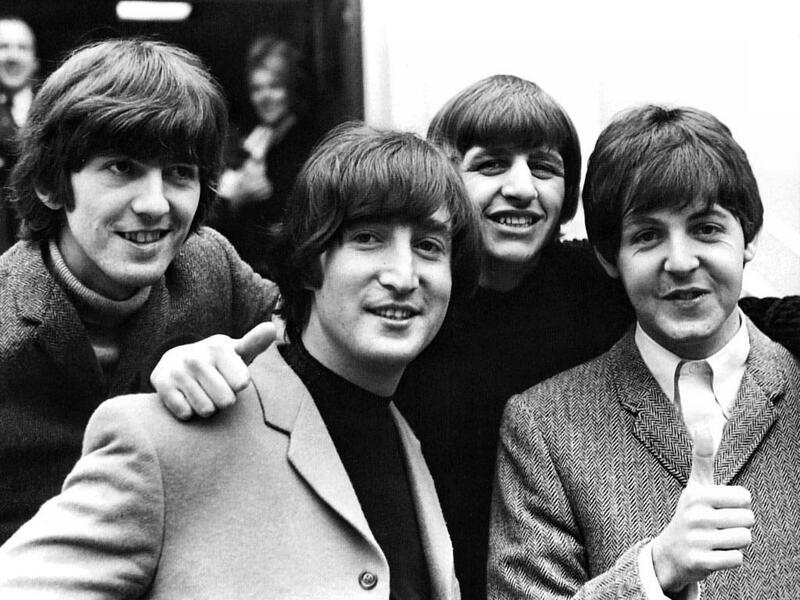 As Lennon and McCartney were known to do at the time, a substitute working lyric, entitled "Scrambled Eggs" (the working opening verse was "Scrambled Eggs/Oh, my baby how I love your legs"), was used for the song until something more suitable was written. In his biography, Paul McCartney: Many Years from Now, McCartney recalled: "So first of all I checked this melody out, and people said to me, 'No, it's lovely, and I'm sure it's all yours.' It took me a little while to allow myself to claim it, but then like a prospector I finally staked my claim; stuck a little sign on it and said, 'Okay, it's mine!' It had no words. I used to call it 'Scrambled Eggs'." LATE NIGHT w. JIMMY FALLON: Paul McCartney & Jimmy Fallon sing "Scrambled Eggs": Preview clip of Jimmy and Paul McCartney singing a parody of "Yesterday" with the lyrics' original place holder, scrambled eggs. "In His Life - Tribute Video"
Ringo Starr, at Age 70. 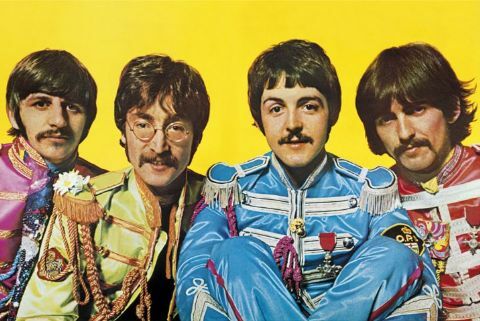 The Beatles, Ageless. This is pretty cool, posted by Yoko Ono on Twitter 4/15. Wish I could afford it! "Ethel Kennedy asked for "a walk through Strawberry fields with yoko" for RFK Center auction. Bid now! http://bit.ly/9OMLY4 "
Ringo Starr appeared on "Late Night with Jimmy Fallon" Jan. 12, on NBC. 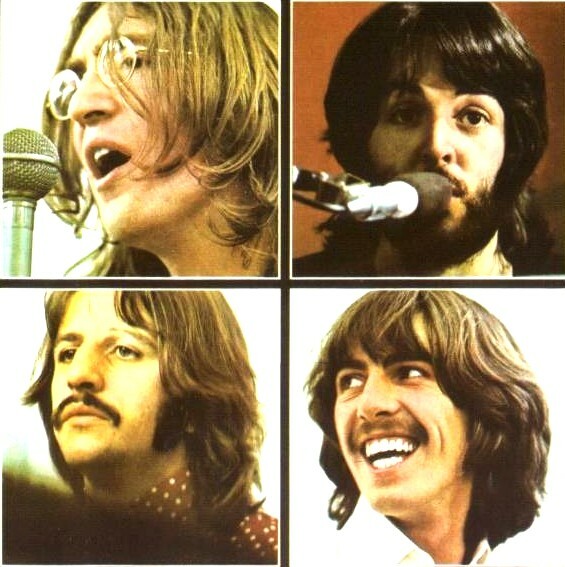 Click on the iPod button below to hear me sing some Beatles' songs!! Go to the next song or back as you choose, just like a real iPod!! 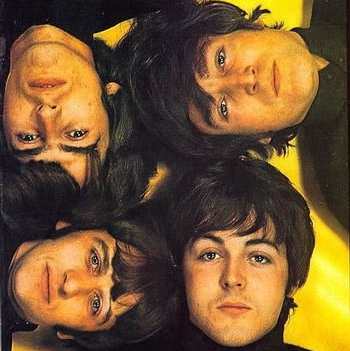 Find many more Beatles photos at Google Images! The Cheap Seats Beatles comments and quips on .wav files! Follow Yoko Ono on Twitter! 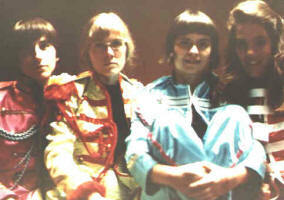 Please visit my pages for The Beatles, The Carpenters, Olivia Newton John, and Linda Ronstadt!